Matthew D. Ekins is a seasoned attorney with a focused practice for individuals and small businesses. Communication with the client, loyalty, and dedicated service are his practicing trademarks. Work and case load primarily focuses in three areas of the law: business, estate planning/probate and real estate. 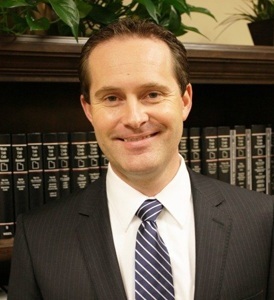 He has practiced law since 2008 and is admitted to Utah and Nevada. Prior to the practice of law, Mr. Ekins worked in the Title Industry for nearly 4 years. Mr. Ekins served as the Southern Utah Bar President in 2015, Southern Utah Estate Planning Council Director in 2012-2014 and is a member of the IHC Dixie Regional Professional Advisory Council. As legal counsel he enjoys working with the widow, the elderly, the veterans and the educators to ensure their rights and interests are protected. Mr. Ekins frequently presents educational topics to these groups and participates in reduced fee or pro bono activities for these people. Author “Large-Scale Disasters Attacking the American Dream: How to Protect and Empower Homeowners and Lenders” Western New England Law Review, Volume 30, Number 2, 2008. Fluent in Portuguese.